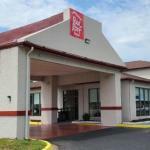 Free Wi-Fi complimentary breakfast an I-95 location and super low rates add appeal to the Hotel Carolina Florence. All 60 rooms at the two-story Hotel Carolina offer cable TV ironing facilities and free local calls. Complimentary perks are a big plus at this hotel including Wi-Fi and daily breakfast. Guests enjoy refreshing swims any time of year in the indoor pool. The hotel offers handy in-house laundry facilities as well as free parking. The Hotel Carolina is off I-95 three miles north of the McLeod Regional Medical Center and downtown Florence. Within 70 miles guests bask in the sun along the Atlantic coastline. The hotel is four miles from historic Florence National Cemetery and eight miles from Darlington Raceway. A five-mile drive leads to Florence Regional Airport.